Man, we're really in the doldrums here, aren't we? I haven't seen a new release movie in two weeks (though some catching-up is in store this weekend), and the past month's worth of releases haven't yielded critical discourse anywhere near the level of Shutter Island or the panoply of Oscar season releases (or simply Oscar season in general). SXSW wrapped, but unless you were there, there's little to discuss on that front (mostly a lot of "I really, really, really want to see that movie"). So, in the interim, I want to take a brief consideration of a topic prompted by television, a format often posited as film when people really like it. More specifically, some thoughts that have cropped up in the last few weeks of watching Lost, a show everyone seems to have an opinion on, even if they're not watching it. Granted, Lost doesn't have the cultural cache it did as the second season got underway, or even the cultural presence its third season finale yielded, but to whatever extent it's possible for narrative television to matter anymore, there seems little doubt that Lost still matters. I just don't think it matters as much as people tend to think it does. I've often been baffled when I read or hear philosophically-slanted readings of the show (summarized, of course, by a book published too far in advance of when any reasonable conclusion of the show's leanings could have been considered - even reading the titles of the individual essays reminds me of how little the show currently has to do with its first few seasons), as any philosophy Lost contains is almost entirely incidental; that is, it references and alludes to past philosophical conclusions, while never claiming a philosophy entirely its own nor expanding on those it mentions. Nor do I find it to be a terribly "smart" show, and attempts to label it as such mostly result in the claim "you have to remember a lot of stuff" (see Everything Bad is Good for You; the section on video games is genuinely interesting, however). Even the show's attempts to invest us in its characters are half-hearted; a handful of tremendous episodes have resulted from this (mostly involving Locke, Desmond, Ben, or Juliette, though I know others have their favorites), but I have a hard time believing anyone watches this for the characters, in the sense that we watched The Sopranos for the characters. While Lost may offer us people of interest, or people who are compelling to watch, it's hard to really attach yourself to anyone on a long term basis. 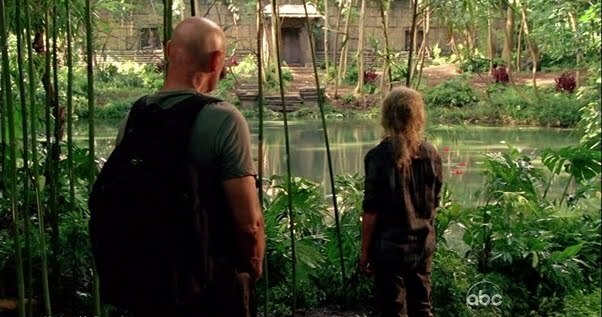 Lost is a game, a series of entertaining clues and revelations that are ambitious without being truly daring, clever without being intellectual, and anticipated without being expected. The joy of the show is watching it unfold (and I say this as someone who, in nearly every episode, doesn't realize that many of the events are as big a deal as they're supposed to be, because quite simply I don't remember most of the episodes all that well); Lost, ultimately, is about watching Lost. But this is how I like my entertainment, and I ultimately hope that the resolution of the series is as anticlimactic as possible. Part of this, yes, is because I really want to watch the wildfire that will consume the Lost fanbase that has carefully followed every episode, webisode, online tie-in, interview, whatever, desperately searching for answers when, ultimately, there are none. But also, such an ending would cement that Lost has been about the journey, about the thrill of new discoveries and the tantalizing hints of uncovered mysteries. Much like The Sopranos, any of the expected or suggested endings inevitably feel rote, and just as the best monster movies rarely, if ever, show the monster, The Island itself is much less exciting the more we've come to learn about it. So the appeal of Lost is neither the characters nor the philosophy, nor even its claims (or more accurately, the claims attributed to it by others) of intelligence, but rather the rare excitement of a great tall tale, in which the people matter little but the events are universally astounding. It's first-rate entertainment, in the vein of Christopher Nolan or a sloppier Alfred Hitchcock, with the expansion of time only television and novels can engage in. I can't wait for whatever's next.